During the day the Flame will visit a number of iconic landmarks including Caerphilly Castle, the Sail Bridge in Swansea, and the Swansea Live Site. Today marks the beginning of the second week of the Flame’s 70 day journey around the UK. So far over one million people have come out to see the Torch Relay. Torchbearers of the day include Colin Jackson, High Hurdling Olympian is set to carry the Flame in Swansea in recognition of his extremely successful career in Athletics and coaching of the sport. Lorelei Westcott, 18, a talented gymnast from Llantwit Major was selected through the Coca-Cola Future Flames programme. Through her devotion to training youngsters in her school and community, and her own sports achievements, Lorelei was nominated for “Young Citizen of the Year” Lorelei now helps train members of the Welsh team and judges competitions throughout Wales. She will carry the Flame in Barry. The evening celebration will take place at Singleton Park in Swansea. 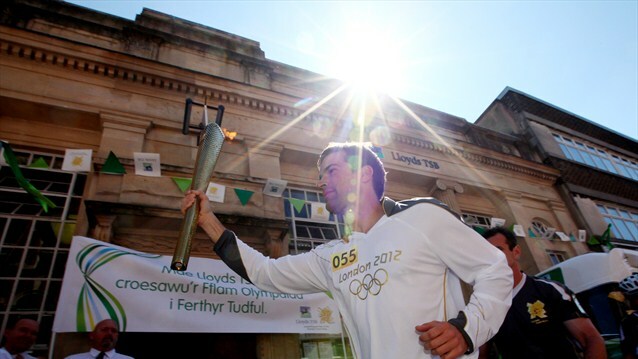 The celebration will feature a variety of entertainment staged by LOCOG and the three Presenting Partners of the London 2012 Olympic Torch Relay – Coca-Cola, Lloyds TSB and Samsung. The line-up includes music from Kids In Glass Houses, a dance troupe who will provide a unique fusion of street performance, theatre and sport and dance act Twist and Pulse. There will also be entertainment from Only Men Aloud and Mark Jermin’s Dance School staged by Swansea City Council. Cardiff, Dinas Powys, Barry, Caerphilly, Pontypridd, Merthyr Tydfil, Treherbert, Ynyswen, Treorchy, Nant-y-moel, Ogmore Vale, Bryncethin, Bridgend, Laleston, Pyle, Margam, Taibach, Port Talbot, Briton Ferry, Neath and Swansea.